Do Christians believe in Santa Claus? Of course. He’s one of us. 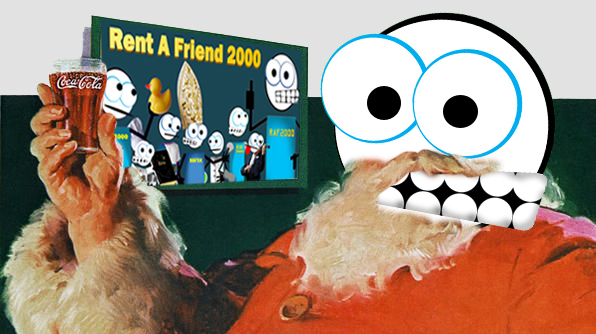 You won’t get too far in the internet’s funderful world of Atheist Jihad Bloggers before you hear someone accuse Christians of being like those who believe that a fat man in a red suit comes down our chimney once a year to put toys in a sock. The connection they are trying to make is obvious- they think Santa Claus doesn’t exist- that only foolish children think Santa is a real person. And they think anyone who believes in God is similarly childish and silly. But they are wrong on both counts, and for the same reason. Yes Virginia, there is a Santa Claus, and you have the right to believe. But I would suggest you believe what is true. The connection is something we call a Straw Man Argument. See, the version of Santa Claus the Blogger Jihad is referring to is the one created by Hollywood and Coke commercials, NOT the real one from history. THERE’S A SANTA CLAUS FROM HISTORY?!?? Yes, Virginia. Now calm down before you spill egg nogg all over my tree skirt. The REAL Santa Clause- Saint Nicholas- was the orphan of rich parents who did good in secret to combat evil, and at least one time we know of, he punched an evil clown in the face to stop his evil ways. Saint Nicholas was the 4th century BATMAN. Wikipedia echoes many other sources when it says, “He [Saint Nicholas] had a reputation for secret gift-giving, such as putting coins in the shoes of those who left them out for him.” The Dutch Sinterklaas is a Christmas tradition where in someone takes on the likeness of Saint Nicholas to give gifts. When the Dutch came to America they brought the tradition with them. So where did he get flying reindeer? How did he become a fat elfish man who eats too many cookies? A children’s book and a bunch of adverts for Coke. No joke. In the early 1800’s, Santa Claus was made more fanciful by the poem story T’was The Night Before Christmas just as Abraham Lincoln was made fanciful by the book and movie Abraham Lincoln Vampire Hunter in 2010. There is nothing which America loves more than dressing up their historical figures with magical adventures [Enter ObamaCare joke here]. The modern images associated with our fat, jolly, mall-wandering friend comes from the Coca-Cola Company in 1931. The ad campaign for the red and white bottles featuring Santa have been a hit for decades, and helped solidify in American minds what Santa REALLY looks like. Before Coke had their mass market say, Santa was tall and thin, short and ugly, dressed in robes or firs. Of course as a bishop, the real Santa Claus DID wear red, but after Coke took over, no one would ever question it again. While they don’t say so, I suspect Santa is fat because Diet Coke hadn’t been invented yet. Maybe they need another ad campaign for that one? So the long and short of it is, Santa Claus is a real person. The version which the Blogger Jihad objects to as ridiculous is, of course, NOT the real one. Its the one created by mass marketing and children’s books. But that doesn’t make Santa Claus any less real than recent movies make Abraham Lincoln not real. We just need to separate fact from fiction. Denying the existence of a real person because of the later embellishments is not reasonable. It’s just as silly as flying reindeer. You think pigeons leave a mess on your car? Hoo boy! While Coke has not featured Jesus in any ads, Oprah Winfrey and a HOST of other American mass marketers have done to Jesus/God what Coke did to Santa, and you need look no further than the angry atheist bloggers to see it. They mock Christians for believing in “some magical man in the sky,” when no Christian ever described God as “magical” or as living “in the sky.” The accusations made against God show that it’s not the REAL God of history which is being objected to. The Bible depicts God as a just, loving, merciful, righteous father and king who made all of human kind from the same first parents, and who came into human history as one of us to pay for the sin debt we could not pay. His coming into human history as one of us is what Christmas is all about- it’s the celebration of the birth of Jesus Christ, who the Real Santa Claus knew was the God-Man. Fully God, and fully man, and the gift which God gave the world because he loved the whole world. This is why we give gifts at Christmas- to reflect the gift God has given us. The gift of Jesus. The gift of free salvation. And Santa chooses this time to give gifts for this very reason- to reflect the generous loving gift giving of God. Merry Christmas! Oh, and Virginia, if Santa comes down your chimney, you might want to call Abraham Lincoln, because the real Santa Claus has been dead for 1700 years. I’m just saying. This entry was posted in SocioPolitico and tagged Christmas, santa claus. Bookmark the permalink.